Got the right bike, got the right GPS, get the right tires. MOTOZ TRACTIONATOR GPS Tires are made for GPS inspired riders who need dependability in all conditions. MOTOZ designed them to get you anywhere on the globe and back home again. Long mileage, serious traction and smooth transition from pavement to gravel to dirt, the GPS does it all well. 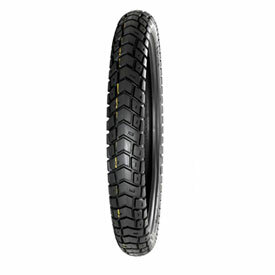 MOTOZ Tractionator GPS Tire is reversible to suit the rider’s needs – either 50/50 or Mostly Off Road. Furthermore, it’s technically 25% stronger than many other adventure tires. 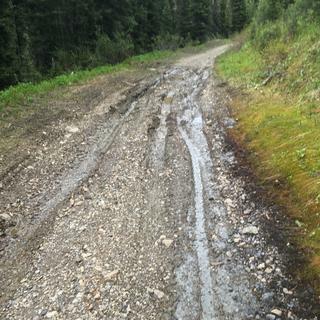 They also feature deeper tread than most adventure tires. And the unique compound results in longer mileage. In conclusion, the Tractionator GPS means dependable traction in a wide variety of conditions. Solid front tire that last a very long time. 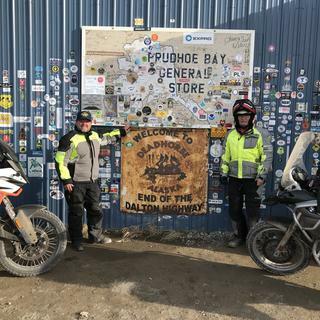 My Dad and I went on an Alaskan adventure ride through BC, Yukon to Deadhorse Ak on the GPS Adventure from MotoZ. Great all around performance on and off road. A great value and they last a long time. The last thing I wanted to deal with on a long ride like that is to change tires mid way. No flats and no issues. Still riding on them. 4 Motoz, no issues, solid performance. 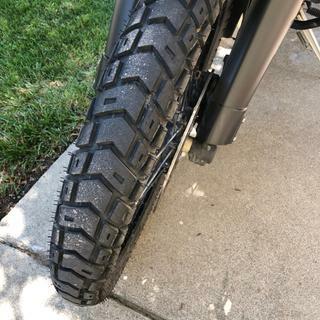 Motoz tractionator gps-Incredible on & offroad-i get miles&sticky grip on pave then lower pressure and deep grooves act like velcro on dirt &rock-thank goodness for this first true enduro big bike tire! Ps-run it in offroad orientation-normal pressue on road35-40 and 15-20on dirt or rock-pls don’t anyone tell me about brkng bead-i’ve been across the CO bdr ophir &4.5 rock sections w/no trouble-some guys run single digit pressure on dirt& these tires can take it &flattennoutvto get on the big knobbies. Have been loving these tires. They handle well on all types of terrain, If you are an all around rider they will work great for you. I've done offroad and twisties. No problems keeping up with guys running TKC 80's and i can keep up with the sport bikes in the twisties. 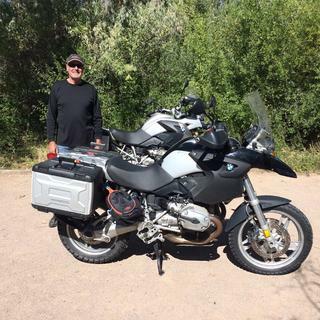 The front does get a little light on my F800GS at higher speeds causing the tire to walk back and forth. That didn't happen with my stock tires. Great tires. I put these on an Africa Twin. I tried these out off road. Much better traction and control than the OEM tires. 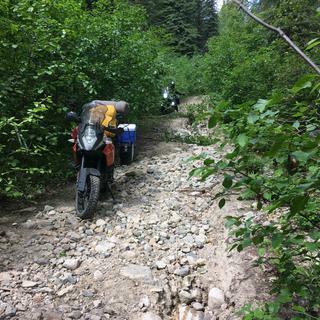 I was nervous the GPS' wouldn't be grippy enough, but they hooked up great in gravel, hard and loose dirt, golfball sized rocks and even a little mud. They handled great on the pavement as well. 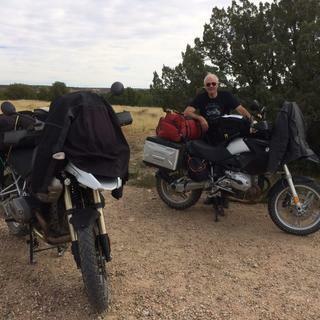 The photo shows what they look like after ~2100 miles, of which ~540 was off-road. On gravel they were comfortable at speeds up to 50-70 mph is spots. Great off-road, better than expected on-road. 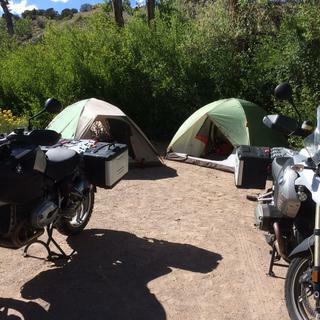 I put them on my R1200GS then went on a road trip. Off road they hooked very well. I was surprised with the on-road experience. You almost don't know you are on a off-road tire. I highly recommend this set of tires. I've got 10,000km on them, 40% off road, no tears, rips or issues. They come stock at 9/32", after 6200 miles they have worn down to 7/32". They haven't slipped out in any way shape or form on me yet. My setup, KTM 1190, weighs in at around 400kg (880#) and still allow me almost drag the foot pegs on pavement. On gravel and dual track trails they are wonderful, where you point they go. I haven't had them in mud over 3" deep yet, but in what I've been through they allowed me to make it down the side of a mountain on a muddy trail without mishap. This is the only tire I will be buying from here on out.